The woman in the photo to the right is my grandmother, and my grandfather is behind her. 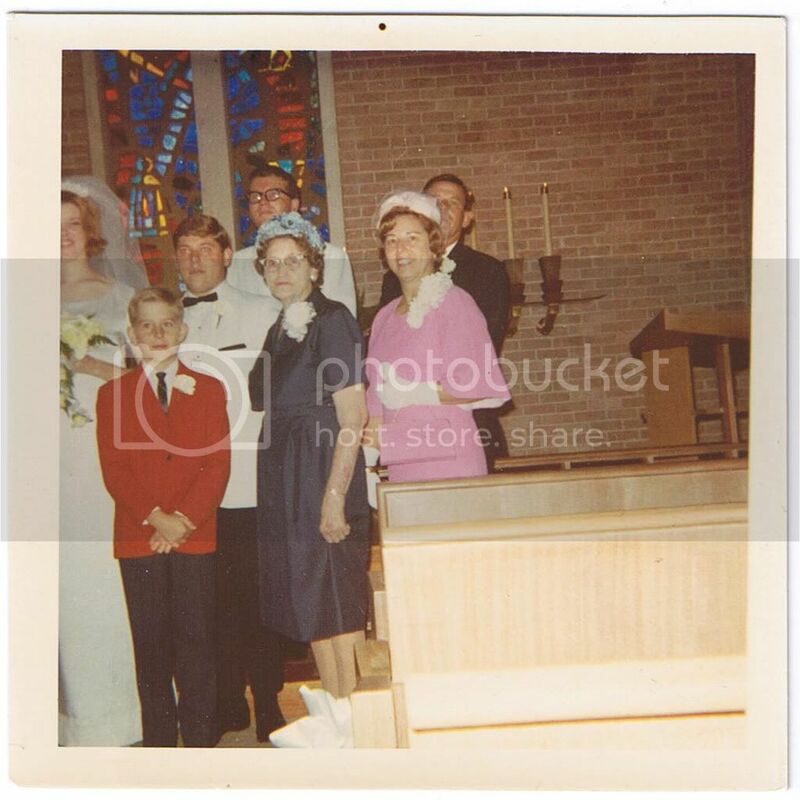 They are standing at the front of a church in August of 1966, at the wedding of their oldest son. My father was 21. My mother was 19 and pregnant with my sister. I don’t presume to know how my grandmother felt about that, but you can see here that she put on a nice dress and smiled, at least for the camera. Maybe, after the wedding, she put away any misgivings about the marriage alongside her hat and purse in her closet. My memories of her are simple, self-referential, and softened at the edges by time, like old photos. But in those memories, I can’t think of a time when she didn’t seem positive, even happy. More than that, she took care of everyone around her, making sure we were entertained and fed, or playing endless games of war with her grandchildren. When I look at this photo of her, it’s with a heart that knows only small bits of information about what her life was like, what it was like to be married to my grandfather and raising three boys. The things I have heard about those years could fit on small scraps of paper in the palm of my hand and not fill it up. I wish I had asked her, had thought to ask her, to tell me about her life when she was younger. I do know that by the time my dad finished high school, the family had moved something like 26 times. My grandpa worked in the steel industry, and whenever he would lose one job (sometimes he quit, and sometimes he got transferred or fired) she would have to pack up the house and they would move again. Now that I am about the same age as she was in that photo, I find myself wondering how did she do it? How did she hang in there? How did she manage to move time after time after time, arranging for new schools and new doctors and new houses? What was it like for her, never being able to settle into a home and stay for a while? I’ve cropped the photo so that you can see a few details about the way she looked that day. The dress, the hat, the handbag, the gloves. The shoes, too, I would guess, though I can’t find a photo of them. All so well matched, ladylike. After she died, I found that purse and hat among her things. For 36 years, she had held on to them. My grandpa gave them to me, and I have them still. To have those two things, from that day, makes me feel like I have a bit of her courage, too. Maybe even some of the strength that let her put on a nice dress and a brave face and just get on with it. To take what life set at her doorstep, and to make the best of it. I borrow her spirit sometimes. If only I could look good in that hat, too. My, don’t I look nice? I only saw glimpses of your grandmother, and I do not think ever a picture before this. Some of her looks passed down to both you and your sister, I think. Moving 29 times? And to think how “NOT” wealthy people were in those days. Put on the hat and grab the courage! Louises last blog post..This is a Joke, Right??? I think people had a lot more “just do what needs to be done” in them back then. I bet that hat would look awesome with your new hair! My maternal grandmother gave my mother, her 21 year old daughter away to my father, who didn’t deserve her, when my mom was six months pregnant with my sister. Gram raised a fine family with a wonderful husband. My father never had a kind word for her. I wish I’d had her longer so she could know we turned out well despite my father’s many failings. Those are lovely photographs and I’m certain your words would honor your Grandmother if she were to read them. I believe she’d be proud of the courage and strength you exhibit – the intelligence and sense of humor too – and smile knowing she was likely a source. I wish I had asked my grandmother a lot more questions too. Now all those questions are unanswered. From what I can see of her, you look like your mother ..
Oh sniff! That was just so beautiful and bittersweet, I’m just a mess after reading it. The more we come to realize what our parents went through to raise us, the more lasy we appear to ouselves. Out family had to move all throughout my childhood and my mother delt with it. Something few women I know today could do. Thank goodness for old photographs. The older I get, they are worth more than bank notes or CDs to me. jennifer, i love those old photos and love the way that you have told this story. the memories you have, as small as they are, you can cherish and hold onto forever. i njoy your blog very much. I imagine that it wasn’t easy for her. When my cousin got pregnant at age 15 (in 1973), it was a family scandal, and her parents publicly supported her but secretly gave her a very hard time. It can’t have been easy for any of them. The world was a different place then. And for the record, I think you’re a pretty courageous woman, from what I’ve seen. Grandmas are the most special people in the world. the things we should know when we were younger. the things we should know now…..why can’t they tell us? What a wonderful post. I’m sure she’s proud to be honored this way, by you. She looked (and sounded) like a lovely woman. I say wear the hat! Kimberlys last blog post..Wordless Wednesday: Can we get THIS one, Mommy? She looks so Jackie in that picture! What a wonderful way to honor her. The crazy thing is that she probably didn’t think about it. She may have just done what was necessary because that is what was expected. Amazingly fun dress and purse. A lovely post. I think about the questions I was too young and self centered to ask my grandparents all the time. How to get in and get them to open up about their lives. What the magic perfect question would have been. Opportunities lost. It makes me braver about blogging, because hopefully, some day, my kids and grandkids will think it’s interesting. This post made me ache for my grandma! Is it just me, or were women built stronger back then? That’s so cool about the purse and hat. Her face is friendly and kind. I bet she made friends easily. I think we all borrow the spirit of our ancestors sometimes, Jennifer. I love that idea…of drawing strength or a character trait from a grandmother who is gone. It is a great outfit! She looks very Jackie Kennedy, doesn’t she? I love this phrase…can I borrow it some time, you seem to be a generous soul…. I remember how women of our generation always wore hat and gloves.